I would like to report further on my trip to Los Cabos, but there isn’t a great deal to report on. I wrote every day, but other than that, I relaxed. 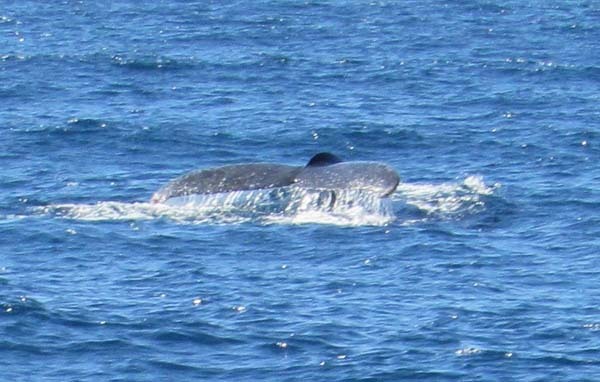 I spent a lot of time sitting under umbrellas, reading or watching the whales cavort just offshore. In addition, I spent a certain amount of time eating and drinking. I also cultivated the art of the siesta. 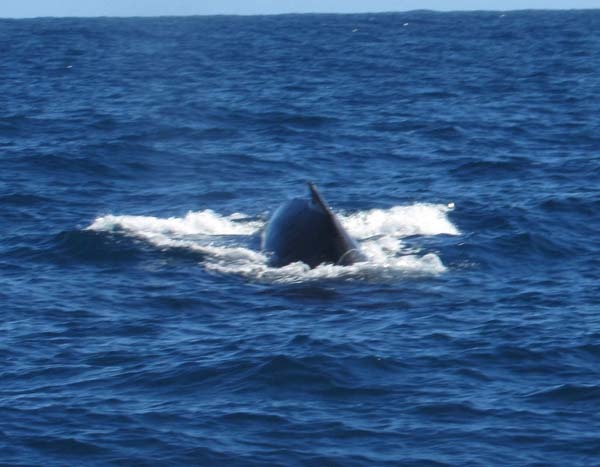 The one significant activity was a whale-chasing cruise, which succeeded in harassing a couple humpback whales. (They didn’t seem to mind that much.) I took a great many photographs, most of which were utter crap because the sea was lively and steep, and the boat was pitching up and down and occasionally throwing gallons of cold seawater into my lap. These are the two best pictures I got, and they’re just details from larger photos that mostly show only sea and sky. It was all good fun, but the next morning showed us what the whales could have done if they’d put their minds to it. Watching from the terrace of a restaurant, we ate breakfast while a pair of whales put on an amazing show just offshore. Breaching, thrashing the water with their tails, “spyhopping,” belly-flopping, “penduncling”— they just went on and on, for at least 40 minutes. There were three very small boats in the vicinity, and presumably their passengers were thrilled and terrified in equal proportions. I would like to think the show was put on by a courting couple, but maybe it’s just the romantic in me. More investigations were undertaken in the local tequila bar, which resulted in a number of discoveries. 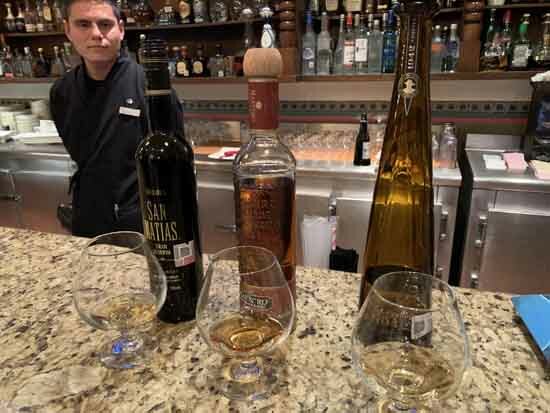 We ordered flights of añejo, which is aged agave brandy similar to a cognac, and is thus tequila for sipping rather than guzzling. In this photo, we see some favorites. On the left is San Matias, which tasted like pecan praline, albeit pecan praline with the addition of a hefty slug of booze. The finish was rich with anise. If there were ever a dessert tequila, this would be it. Maestro had a smoky flavor with a rich caramel taste, comparable to a good whisky. The finish had a big hit of tobacco. Don Julio 1942, on the right, is already popular in the States, with somewhat lighter caramel notes and a hit of vanillin. We also enjoyed Cuervo Gran Reserva, which will drop your bank account by a considerable amount unless you order it, like we did, in a flight of añejos. It’s a dark smooth tequila, extremely mellow, with subdued flavors of smoke and molasses. I’ll have to check the local liquor stores for some of these, and see how they’re priced in the States. On my return trip, I was worried about getting through customs in time to make my connection, but I sped through customs practically at the speed of sound, and had over an hour to meet my next flight even though my random number came up. Fortunately they were only interested in finding explosives in my carry-on bag, and no cavity search was involved. Just saw Metropolitan on Audible! I read this to my wife a couple of years ago. When “City on Fire” comes out on Audible, we’re definitely buying it! Any ETA? I didn’t know Metropolitan was yet available, but then I’m just the author. City on Fire will be soon, I’m sure, since I figure they’ll have recorded them at the same time. > Fortunately they were only interested in finding explosives in my carry-on bag, and no cavity search was involved. Loose lips sink airplanes!!! What if ISIS read your comment?!?!? No, this trip wasn’t tax-deductible, since I could write at home. The whale-watching trip probably counted a research, though. Next post: Now Hear This!